The Vancouver-produced thriller that made international headlines but China doesn’t want you to see, The Bleeding Edge, will be screening at the Vancouver Asian Film Festival as the Centerpiece Presentation, on November 5th at 7:00pm at International Village Cinemas. 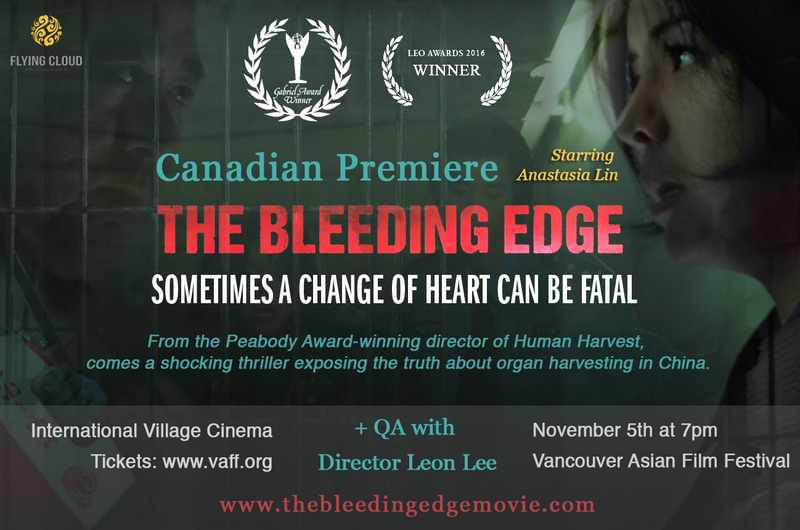 The Bleeding Edge is a narrative feature by Vancouver director Leon Lee, who won a Peabody Award in 2015 for his documentary Human Harvest, about the horrors of forced organ harvesting in China. The Bleeding Edge is also nominated for a VAFF 2016 Best Canadian Feature Award. The film stars Chinese-born Canadian actress Anastasia Lin, winner of Miss World Canada 2015. Ms. Lin, an outspoken campaigner for human rights in China, was banned from competing in the Miss World final in Sanya, China last year and denied entry to the country because of her political activism. Ms. Lin will be competing again in the upcoming 2016 Miss World pageant in Washington DC, where she hopes to claim the crown she was denied in 2015. The Bleeding Edge takes place during the onset of internet censorship and surveillance in communist China, when western tech companies created software to monitor the activities of Chinese citizens. The fate of a young mother (Lin), imprisoned in a labour camp for her spiritual beliefs, reveals the project had a far more sinister motive. This film exposes the chilling truth about how the surveillance system in China continues to terrorize and silence a nation. This year marks the 20th anniversary of the Vancouver Asian Film Festival. Since 1997, VAFF has become the longest-running Asian film festival in Canada, promoting and celebrating the diversity and depth of Asian culture and empowering Asian actors and filmmakers to help shape mainstream culture.